Adele Devine is a teacher at Freemantles School for young people with autism in Surrey. She, along with her husband, have created a range of award-winning software for special needs, SEN Assist. She's writing here on the Special Needs Jungle blog about how to make sure that children with autism are getting real benefits from computer use. Don't miss Adele's, 10 Tips for developing a healthy relationship with IT, included in the article. Technology is motivating for most children, but to those with autism it’s more. The computer can become a safe place – it’s predictable, it’s got every motivator on the planet, it’s a world behind a screen that can involve and include. Once they find this safe haven is it any wonder that the child with autism wants to be there every minute of the day? They might seem to become manageable and happy rather than ‘bouncing between the walls’, but we must look at what they are actually achieving on the computer. Is the IT including or isolating, educating or babysitting? Children with autism benefit from structure. If left to their own devices they might be on the computer all day and do nothing, but click between ‘youtube’ videos or sound files. So should we stop them? No, but we must to take control early on and structure their time. This way we will help them to develop a healthy relationship. Temple Grandin (author and professor, herself autistic) believes that without "the gifts of autism" there would probably be no NASA or IT industry and most autism experts would agree. Bill Gates, founder of Microsoft (widely believed to have Asperger’s syndrome) demonstrates the possibilities if the computer ‘obsession’ is correctly managed. There is also the ‘dark side’ of this relationship. The computer can reduce social interaction, nurture obsessive behaviour or even misdirect skills towards illegal computer hacking. The ongoing case of hacker Gary Mckinnon, who faces possible extradition rings warning bells. His mother Janis Sharpe says, "When Gary was nine, we bought a primitive Atari. He would beg me not to send him out to play so he could use it. We wanted him to mix more but we didn't want to deny him the information, pleasure and security computers gave him. They were an outlet for him to be himself, and that boosted his self-esteem." Richard Mills, director of research at the charity Research Autism, believes the answer is complicated: "The computer age totally changes the world of autism. Things are instant, and they are unregulated. We see tremendous advantages to this if it is properly managed – and huge pitfalls if it isn't." Support for parents and teachers ‘managing’ this situation. SENAssist software was created by specialist teachers to help develop structure from an early stage. It’s based on autism specific training, and years of practical teaching experience. SENAssist was created to be something to switch on and see work without having to know the theory first. By using ‘autism friendly’ structures and motivators from the start we secure the foundations for a positive relationship. Visual and repetitive: Children with autism are often visual learners. The stories and activities have symbols that associate with the words. The writing is highlighted as the words are read. The first 100 high frequency words are repetitively used for the stories and activities. SEN Assist activities are based on language activities used by speech therapists. The resources are based on PECs. Speech Therapy: Activities are based on speech therapy, helping teach prepositions, pronouns and sequencing. Resources are designed to enable pre verbal children to answer questions. Praise is also varied to extend the vocabulary. Individual motivators: The first thing the child must do is choose their motivating character. There are 48 to choose from – pirates, dinosaurs, trains etc. This motivator stays on the screen throughout cheering them on. The work system at the side will show how many tasks they have left to complete. Work systems and token boards: A work system shows the child how much they must do creating a visual structure. The use of ticks and crosses on token boards is deliberate – they learn to accept seeing a cross when it is introduced on the computer. Self esteem: It’s important to set a level to suit the child. We must set them up to succeed and introduce challenge gradually. Have the computer in a communal area. Have ‘computer time’ so it becomes one of many daily activities. Establish the idea of turn taking early on. Encourage a range of different activities on the computer. As skills develop use a work system to structure computer time. Give typing a function by making their name the computer login. Avoid programs or Apps that speak for the child before they are 6. Try ‘switch’ programs for teaching cause and effect. Try adapting the keyboard or getting a one button mouse. Use visual count downs and stick to the ‘rules’. The Education Resource Awards: SEN Assist wins the award for ‘Best Special Education Resource with ICT’. 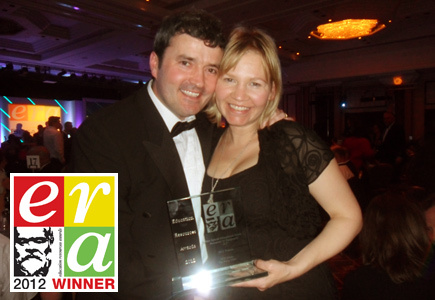 SEN Assist has recently won the award for ‘Best Special Education Resource with ICT’ in The Education Resource Awards. The judges commented that “The Fairy Tales was an inclusive, interactive product that allows a wide range of students to improve their knowledge of high-frequency words. With logical lay-out, clear instructions and motivating images, the product will help to engage the learner. Additional printable activities also help to ensure that the teacher can offer further support"
Adele has kindly donated a copy of their Early Shakespeare software to More House School, an independent specialist school for boys with SpLDs and ASDs, attended by my sons.